As Nora quietly copes with the revelation that Eobard Thawne killed her grandmother, Team Flash must focus on a new threat - a new meta-tech villain called Silver Ghost, whose powers let her control motorized technology, who intends to build a new Rogues gang starting with Weather Witch. At the same time, Cisco and Caitlin start to discuss the possibility of creating a medical treatment to neutralize the metagene. The Return of Barry Allen (Eobard Thawne's backstory as a Flash fanboy driven crazy by the knowledge he would become his hero's worst enemy ), the JSA comics of Geoff Johns (Thawne/Nora relationship resembles Rex and Rick Tyler), The Fast And The Furious films (title is a pun on the name, plot involves fast cars) and every X-Men comic to deal with the concept of a "cure" for mutation. Given the dangers posed by meta-tech, it seems highly likely that the usual rules regarding evidence might be suspended so as not to allow a criminal access to a piece of technology that might be used to escape. Apart from being a control freak who doesn't cope well with surprises, why does Cecile lose her cool over Barry having to leave to deal with "police business" and Nora testifying instead of him? Surely this isn't the first time a police officer scheduled to testify in court got called away because of an emergency or be delayed by a traffic accident? Is a one-day trial delay really going to kill her case? The whole subplot with Caitlin and Cisco arguing the ethics of a metahuman cure is idiotic and horribly out of character for both of them. Granting that Caitlin has turned around on her "other self", she seems to have completely forgotten how scared she was of her powers and how desperate she was to get rid of them. Cisco, in turn, seems to have completely forgotten how much he likes helping people with his abilities and being a superhero. They should both be smart enough to realize they could make a general cure for metapowers and find a way to make it available while insuring it isn't mandatory to use... which eventually is what happens! What was the point of Silver Ghost saluting the guards? If Silver Ghost disabled everything connected to the Iron Heights prison transport, why did the on-board security cameras still work and get video footage of her when the door locks failed? Weather Witch turning herself into the cops directly would have been way easier than hacking a weather system to try and get Team Flash's attention. Not to mention a lot less illegal, even if she did think that getting a hero to vouch for her would help sell her story that she was kidnapped. Why didn't the security cameras in the truck catch Weather Witch's confusion at being busted out? Surely there should be cameras watching the inside of the truck as well? So the CCPD doesn't leave any personnel in the evidence lock-up or the cell-block where prisoners are kept when all the vehicle sirens go off at once? What kind of stealth vehicle has glowing blue rims? Silver Ghost is kind of an idiot if the first thing she does after stealing an experimental stealth vehicle is drive around really fast and make it blindingly obvious where she is. Come to that, why does Silver Ghost need to recruit Weather Witch anyway? Couldn't she just steal the Weather Staff and use it herself? How the heck does the Weather Staff let someone teleport? Thawne's monologue about wanting to go back and become The Flash matches up pretty well with Thawne's origins as depicted in The Return of Barry Allen. It was revealed here that he was a Flash fanboy from the future who copied his hero's accident so he could go back in time and meet him. Unfortunately, this led to his discovering a piece of knowledge lost to the historians of his time - that The Reverse-Flash was a man from the future named Eobard Thawne. The knowledge that he was predestined to become his hero's worst enemy drove Thawne mad and made him determined to kill The Flash so that his life would not be wasted. There is a previously established DC Comics villain called The Silver Ghost, but they have no connection to the Arrowverse villain. The first Silver Ghost was an enemy of The Freedom Fighters of Earth-X, who fought the team during the time they briefly traveled between worlds and came to Earth-1. Born Raphael Van Zandt, he was a crime boss who had the power to turn anything he touched into silver. Pre-Crisis, he used this power to turn half of the Freedom Fighters into statues and threatened to melt them down if the rest of the team didn't obey his orders. Thankfully, they were eventually restored to life after Silver Ghost was defeated. Post-Crisis, Raphael Van Zandt was a prominent Nazi leader on Earth-X, who was brought down by the hero Firebrand. He would later travel from Earth-X to Earth-1 in search of Firebrand and gained his powers during the trip between dimensions. He hired the Secret Society of Super-Villains to help him fight the Freedom Fighters and Firebrand. The two would eventually be turned into silver statues together as the two enemies struggled while the Silver Ghost tried to use his powers only to have his ability reflected back upon him. The Arrowverse version of Silver Ghost is a former USAF pilot, mechanic and expert on vehicle operations named Raya Van Zandt. She was dishonorably discharged. Her call sign was Silver Ghost. 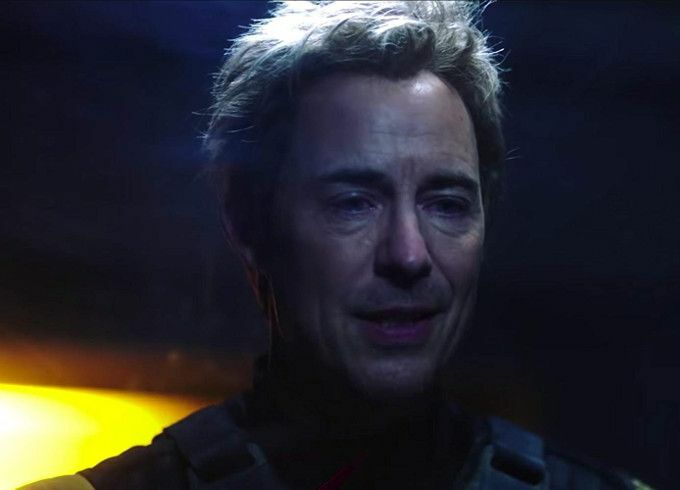 At the end of the episode, it is revealed that Eobard Thawne is living on borrowed time and has roughly 51 minutes before he is presumably scheduled to be executed. The entire set-up is reminiscent of the JSA comics of Geoff Johns and the relationship between Rex and Rick Tyler - two of the heroes who were known as Hourman. Rex, the father, was pulled from time before he was fated to die and placed in a pocket dimension. For one hour, he and his son would be given a chance to say goodbye to each other as Rick approached his father a few minutes at a time when he needed advice. The Lamborghini Barry touched was saturated with unstable dark matter. Because he was phasing at the time, it caused his molecules to destabilize. The winds hitting the airport created by Weather Witch ranged from 150-250 MPH. Cisco ran a bio-chemical analysis on the shards from his hands and discovered that they were draining the dark matter from his system. This proves that the shards weren't dampening his powers - they were removing them. This means that Cicada's dagger has anti-dark-matter properties, which means they could potentially use this to synthesize a serum to negate metahuman powers. The meta-tech keychain fob broadcasts a dark matter pulse that can take over anything with a guidance system or an engine. The police call in 595 reports when their sirens start sounding in their own at CCPD HQ. A 595 is the scanner code for a runaway car. The Stealth Auto-Mobile, or SAM, took ten years and $24 million to develop. Rumor has it everything under its hood was developed by WayneTech. It is said to be completely untrackable by conventional radar. It is also capable of short-term phasing, can become invisible and has front-mounted rockets that can be remotely detonated. Thawne: For as long as I can remember, all I ever thought about was myself. But that will not be my legacy! That will not be the legacy of Eobard Thawne! (hissing) Let me help you. Nora: I don't want your help. Not anymore. Cisco: (Sighing with relief) Hey. You feel that? Cisco: That's the feeling of free time!c KA unbillable hours, so we'd better not be seeing any invoices from you in the near future. Sherloque: Oh, that's all right. Sherloque: (quietly) This is one mystery I will solve for free. Barry: I think part of being a hero is being able to see the good in people. So yeah. Maybe someday, in the future, even Thawne could change. Besides, if we don't believe in people, who will? The Flash: I can't stop vibrating! Thawne is revealed to be the one who taught Nora how to use her powers to time-travel. Thawne claims that he helped Nora because they shared a desire to go back in time and get to know The Flash. Thawne claims he never told Nora that he killed her grandmother because he had just assumed Iris West would have told her that. Ralph is said to be visiting his mother. Nora refers to the events of Elseworlds, saying she picked up Barry's blue suit figuring he'd be sick of the color green. Joe West is said to be visiting Wally West, along with his and Cecile's new baby, Jenna. Cecile is returning to work for the first time since her pregnancy. Her first case is the trial of Weather Witch, at which Barry is scheduled to testify. Weather Witch was last seen in 507. Weather Witch's case number is 99512. Weather Witch's crimes occurred between November 20 and 27th 2018. Episode 507 aired on November 27, 2018. The charges include property damage at Iron Heights, grounding 21 flights and attempted murder. Cecile gets an odd feeling during the trial. Caitlin removes the meta-metal shards from Cisco's hands so they can start healing properly. Caitlin can now use Killer Frost's powers to suture a wound. Barry is temporarily left unable to stop vibrating after his encounter with Silver Ghost. The Pipeline cells are located directly under the entrance to the STAR Labs comms room. Nora is called to testify instead of Barry. Cecile decides to pursue a lighter sentence for Weather Witch since she can telepathically feel her remorse. Cecile starts making a case that nobody was hurt during Weather Witch's rampage and argues against her own evidence that lighting struck the tarmac by saying that it could have struck people. Weather Witch's lawyer tries to argue that dark matter infusions can corrupt a person. Nora says that isn't how it works. Weather Witch changes her plea to guilty, saying she deserves to be punished for what she did. Cisco argues they should make a metahuman cure to save the world from people like Fallout, from 410. Caitlin, in turn, argues that not everyone wants a normal life and metahuman powers can do a lot of good. Nora insists that Weather Witch had to have been "in" on her escape because bad people don't change. Silver Ghost is planning to form a new group she calls The Young Rogues, that will be young women. She has a few recruits in mind, but wants to keep it to just her and Weather Witch to start. Silver Ghost has a file on Spyn, from 504. Silver Ghost wants to raid an ARGUS facility and steal the technology inside of it. She figures the security system can be disable with a precise lightning strike. Sherloque gives Barry a copy of Uncaged Desire to read, which he says was dropped off by The Legends. This is the book it was revealed that Mick Rory had published under his nom de plume Rebecca Silver in L408. Barry says later that it was surprisingly well-written. Iris is able to get a copy of Silver Ghost's sealed military record from a contact of her father's named Major Morgan. It shows that she had an exemplary record before going overseas for a failed mission, coming back, working a desk job for two months then suddenly being dishonorably discharged. Iris believes she became the scapegoat for the failed mission. Cisco believes that, unlike Barry, he can't balance being a hero and having a wife and kids. Barry affirms that he believes anyone can change for the better, specifically pointing to Captain Cold. The tech Silver Ghost wanted to steal from ARGUS is a stealth automobile developed by WayneTech. Weather Witch ices up the road to stop the SAM. She then manages to teleport herself and Silver Ghost away with a lightning bolt. Wally is apparently still in Tibet. Cecile tried using the extrapolater to go visit Joe and Wally in Tibet and wound up in Fiji. The Breakfast Club is one of the few movies both Caitlin and Killer Frost like. Killer Frost is said to have a crush on Bender. Caitlin takes Cisco to her father's lab, thinking Cisco can use his research to create a metagene to cure one. She agrees to help Cisco find the cure he wants so long as he agrees not to force the cure on anyone Cisco agrees to that. It is revealed that Thawne is facing a countdown until he dies in 2049. at the end of the episode, he has 51 minutes and 56 seconds left. Nora says she doesn't trust Thawne but is willing to give him a chance to change her mind about his desire to change for the good. Sherloque approaches Gideon in the Time Vault and asks for all of her files on Nora. Gideon says that all of those files were erased by Nora. Joe is said to be visiting Wally in Tibet. Cecile doesn't even try to hide the fact that she's sabotaging her own case trying to get Weather Witch leniency. Barry is sidelined for the entire episode by some mysterious property of Silver Ghost's powers that causes him to become insubstantial when he tries to touch a car she is controlling while phased. Quite possibly the dumbest episode of The Flash ever and certainly the worst of Season Five and not just because Barry is barely in the episode. Everyone is written out of character to make the plot work. Nora in particularly is twisted around to such a degree that she actually manages to eclipse Iris as the most annoying and pig-headed character on the show. And that's an accomplishment in an episode where Cecile starts intentionally trying to blow a case, Killer Frost wrecks STAR Labs equipment with Caitlin's apparent approval, Cisco forgets all about "great power = great responsibility", and the generally psychotic Weather Witch from three episodes ago is suddenly a reluctant villain. Worst of all? We're going to see more of The Young Rogues after this, gods give us strength.